PALM BEACH, Fl./BAGHOUZ, Syria (Reuters) - Islamic State militants in eastern Syria still held out late on Friday, the U.S.-backed militia besieging them said, after U.S. President Donald Trump said the jihadist group had lost its last scrap of territory. "Heavy fighting continues around mount Baghouz right now to finish off whatever remains of ISIS (Islamic State)," said Mustafa Bali, head of the Syrian Democratic Forces (SDF) media office on Twitter. Trump showed a before-and-after map to reporters to demonstrate the extent of jihadist losses during his presidency. He has said several times in recent weeks that Islamic State had lost all its land even though fierce battles persisted. Two hours before Trump gave a statement declaring the group's territorial rule over, a Reuters journalist heard two air strikes and saw smoke at Baghouz, where Islamic State fighters have been waging a last stand. Islamic State's loss of Baghouz ends its grip over populated territory in the third of Iraq and Syria it once ruled, but the group remains a threat with fighters operating in cities and remote areas elsewhere and able to mount insurgent attacks. A U.S.-led coalition has helped the SDF drive Islamic State from swathes of northeastern Syria and down the Euphrates since 2015 with air strikes and special forces assistance. An array of local and international forces - some of them sworn enemies of each other - have conducted different campaigns against Islamic State during that period, inflicting major defeats on it in 2017 with the capture of Mosul and Raqqa. The Syrian Ambassador to the U.N. Bashar Ja'afari told reporters that Islamic State was not yet finished in Syria, but that it was the Damascus government backed by Russia and Iran that was genuinely battling it, not the United States. Some Islamic State fighters remain holed up in the central Syrian desert, an area entirely surrounded by the Syrian army. "Here's ISIS on Election Day. And here's ISIS right now," Trump said, using the acronym for the group, as he displayed the map with the 'before' portion full of red dots and the after map empty. "You guys can have the map. Congratulations," Trump said. "I think it's about time." The president has previously displayed a map illustrating the diminution of Islamic State. Although he said the "before" map showed Islamic State's presence at his election in 2016, the version given to reporters showed it was dated 2014, when the group's territorial control was at its peak. U.S.-backed forces in Syria and Iraq captured extensive stretches of that territory before Trump's election. The SDF has been battling for weeks to defeat Islamic State in Baghouz on the Euphrates riverside at the Iraqi border. This week it announced it had captured a jihadist encampment that represented most of the remaining enclave. 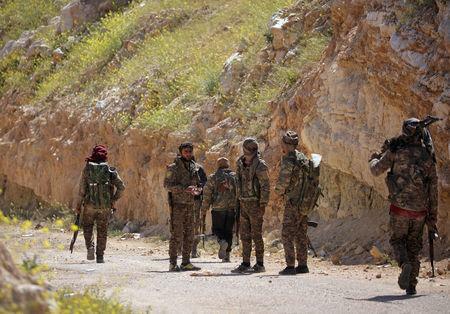 The last small groups of jihadist fighters had been pushed onto a sliver of the riverbank and the cliffs nearby said the SDF, which holds the area at the top of the cliffs. Bali told Reuters earlier on Friday that SDF fighters had clashed overnight with militants in more than two positions where they were refusing to surrender. The jihadists were holed up in what appeared to be caves in a rocky shelf overlooking Baghouz and in trenches by the river, he said. "Our forces are trying to force them to surrender, but so far the clashes are continuing." Over the past two months, more than 60,000 people have flooded out of the dwindling pocket on the Euphrates around Baghouz, about half of them civilians including some Islamic State captives, the SDF has said. Of the rest, about 5,000 were surrendering jihadist fighters. The others were supporters or family members of the group. The fighters who refused to surrender to the end were mostly foreigners, the SDF has said. The SDF transported most people who left Baghouz to displacement camps in northeast Syria where aid agencies have warned of dire humanitarian conditions. The number of people inside the enclave when the assault on it began in January was unexpectedly large, adding to the difficulties at the displacement camps and repeatedly delaying a final offensive.